I've heard it said that artists are a moody bunch. Our keen senses trigger emotions. We feel deeply. We dive into the pits of despair and climb back up to elation in a matter of moments. Lately, this has been the case for me, but I don't believe this is exclusive to "artists." 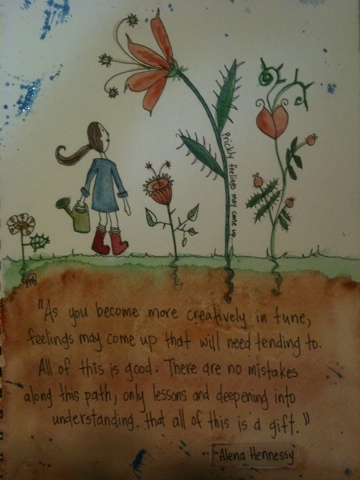 Anyone who is in a creative state of change will come up against a mix of prickly feelings. Whenever we step out of our comfort zone to take more control of creating authentic lives that will make us happy, we make ourselves vulnerable to feelings of fear, self-doubt, confusion, overwhelm, anxiety, loneliness, and more of the prickly stuff. Whether we're trying to design or redesign our lives to accommodate new family members, a move, a change of career, or the building of a dream, these are feelings we must face. At this point in my life and my creative journey, I can't help but acknowledge that I brought this all on myself. I invited these feelings into my life. But who's to say these feelings are bad and should be avoided at all costs? Aren't they all a part of this wild ride we're on? We would all have to face challenges one way or another. If I take some of them on willingly (like when I veer off my prescribed path in search of bigger happiness), I may get some good practice for overcoming other big challenges. Sparring with our self-imposed fears and doubts can prepare us for other struggles in life. The fantastic news is, there is a flip side to these feelings! We find that sunny side by facing the dark stuff head-on. On the other side of fear there is courage. If we toy with self-doubt, we are forced to overcome by learning to build faith and trust. If we take on anxiety, we will eventually learn to find peace. Our vulnerability opens us to a deep truth that may inspire others. It's part of our hero's journey. It's all ours to work out and overcome. It is for me. The creative process can be a rough road at times, but it is a road that inevitably leads me back to the best parts of myself. The introspective parts, the brave parts, the honest, tender, compassionate, patient, determined, inspired and curious parts-- they are all on the other side of those uncomfortable feelings that may come up when we take on this journey. So yes, I am moody and isolated at times. I mope and fret and rehash my mistakes, but it's because I'm preparing for a stealthy ninja-like attack on the negative feelings. I'm excited to feel what's on the flip side.